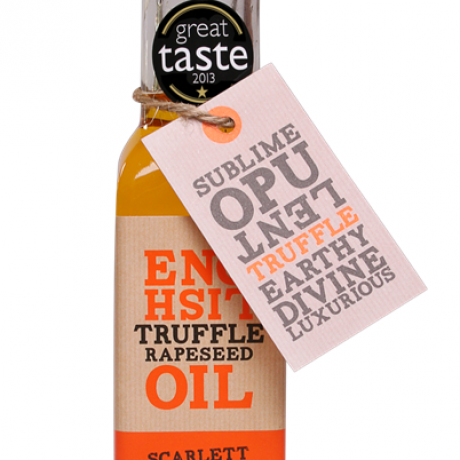 Award winning truffle oil, made with British grown truffles, and British extra virgin cold-press rapeseed oil. Golden, earthy and intense, use this as a finishing oil for pasta, risotto, stews, soups and egg dishes. Order arrived in good time for xmas & was well packaged. Order arrived in good time for xmas & was well packaged. Have bought these locally in the past & they are delish! Amazing flavour. The best curd I've ever had, and I've had a LOT! this stuff is divine. had it on a scone with clotted cream. i have to stop myself getting a teaspoon and eating it straight from the jar. I'm from the north of Slovenia and we use this oil more than any other oil. Over the years, I've probably tried all the brands of pumpkin seed oil here in the UK, some are better than others but this is definitely the best. It says it comes from Slovenian farmers which is important, many brands use cheap Chinese seeds and the oil is inferior. This even happens in Slovenia but you can taste the difference. It's a bit more expensive than it is at home, and even a pound more than some of the other brands in the shops here but it is the one I will be buying from now. Fast food for families, with none of the nasties!